Vaishali Pawar recently had a terrible accident where her face got smashed in a elevator leaving her blind, and her cheek and jaw shattered. She needs immediate surgery to fix her mouth and salvage her sight. 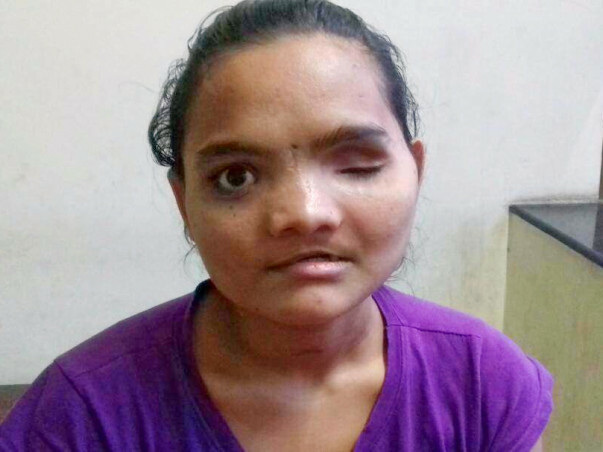 Her mother Sunita has been in Hyderabad for months trying to put her daughter's face and life back together. Her parents are daily-wage workers who need all the help they can get to give their daughter a future. “One of her eyes came out and the other was smashed when she fell. One eye was put back – but her nerves are damaged. She is now completely blind. Perhaps it is a good thing – it would kill her to see how her beautiful face has changed,” says Sunita about her youngest –Vaishali. Having studied at her uncle's place all her life, after class 12, Vaishali decided to come home. 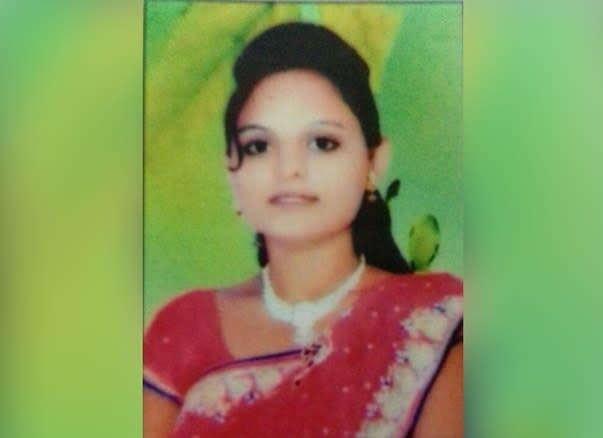 She missed her parents, especially her mother who lived in Rajkot, Gujarat. To spend more time with mother, she even decided to accompany her where she worked and help out. Her mother was paid Rs 6,000 per month and Vaishali was paid depending on how much work she did. They worked at a small packaging unit where workers packed bathroom fittings. It was here that Vaishali fell down and hit her face. The accident shattered her cheekbones and jaw, and made her blind. “The injury took out her teeth and gums. Now, when she eats, her food comes out of the nose. 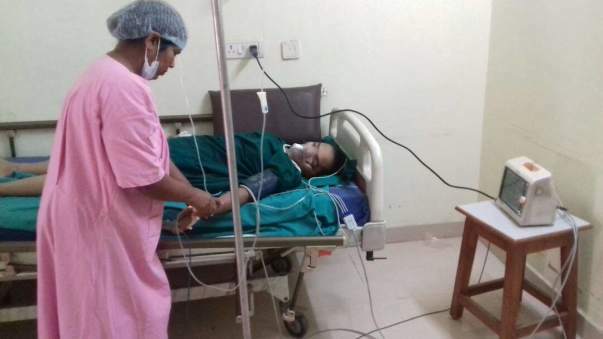 She needs urgent surgery so she can eat properly and live,” says Sunita. “Her father is very simple-minded. He has already given up on her and asks me to be thankful that she is alive. But what kind of life is this? Who will look after her when we are gone? I have to do everything I can to make sure my daughter can take care of herself,” says Sunita. Sunita's husband Manohar makes Rs 250 for every day that he works. Even when Sunita was working, the family aggregate income was about 13,000 per month. When Vaishali's accident happened, the family's savings were quickly wiped out. Sunita fought with the company's owner and got him to cover a part of the early expenses. 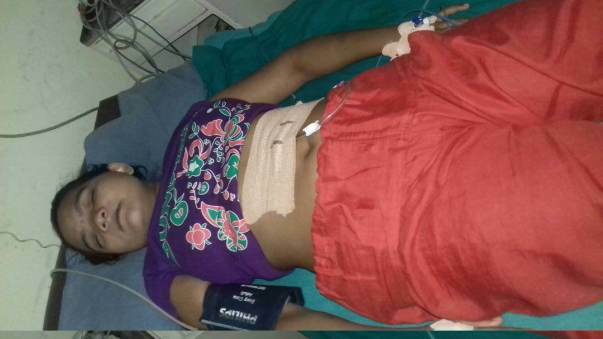 She also took loans so Vaishali's life could be saved and she would get first aid. Her older son Rahul, lives with his uncle and is the sole person in the family who supports Sunita. Sunita is determined that her daughter be able to live a life of dignity. 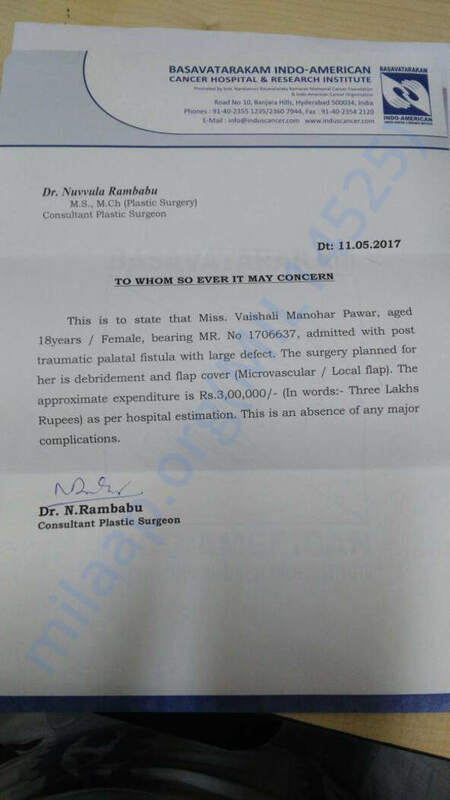 Contribute now and help Vaishali get corrective surgery.